Guess who's back (back)? Back again (gain)? Ronnie's back (back), tell a friend (friend)! Guess who's back, guess who's back, guess who's back, guess who's back...DA NA NA! HEY GUYS! Yes, I am finally back after a longer-than-expected hiatus. Did you guys miss me? Because I definitely missed you. As most of you know, I took a break late March due to stupid life stuff, but now my mind is refreshed, and ready to go! So with that said, here is refreshingly colorful, yet bold look for you. Mint is a huge color this season, so I thought I'd create a look using the shade. I tend to shy away from this color in my looks because it can be quite intimidating, so I gave it an edge with the purple liner. I am really pleased with the way it turned out, and I think it's the perfect way to get back into the swing of things! I really hope you guys liked this look, and even more so, I hope it was worth the hiatus! I've truly, madly, deeply missed every single one of you! I really appreciate those of you who've told me that they cannot wait for me to start blogging again. It means the world to me! Thank you, from the bottom of my heart. You all definitely know how to make me smile. Love you guys...it feels great to be back! Also, I have some super exciting stuff coming up that I cannot wait to tell you guys about, but I have to keep my mouth zipped in the mean time. EEEK! I hope you all are well, happy and healthy. See you soon, and have a great week! I'm really curious about the news now, though XD Looking forward to hearing from you again! I love it! Definitely worth the wait. I also love that mint is totally the color on my eyes today :) Great inspiration pic too!! I wanna know the news NOW! Tell me tell me tell me! You've created a monster, cause nobody wants to see Mashall no more, they want Ronnie, he's chopped liver. Or something. Aw, shucks, lol! Thanks Cecilie! I WANT TO TELL YOU! But I don't wanna get spanked, lol. omg i just snorted. what a cute baby!! YAY! You're back! I'm so glad! I love your blog and this look is beautiful! This is such a lovely look. That green is pretty and looks awesome with the purple liner, rather than the usual black. Glad you're back! I'm a newer fan, but I am so happy you're back! I think your makeup is amazing. You have an awesome talent! i love your looks - so i really missed you :) regards from vienna! So happy you're back! 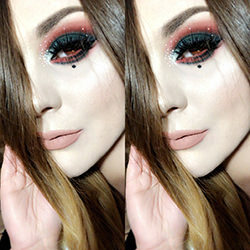 I always get so excited when I see one of your new pretty little eyes popping up on my sidebar! Super awesome! Love how you have the talent to translate a picture into an awesome eye look..! I love the picture and how you translate your inspiration to a makeup look!! What's the super secret??? lol jk Can't wait to here!! 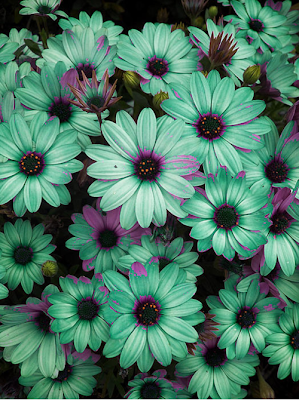 The purple and mint look so unexpected awesome together! I don't really wear mint that often...um ever...but I think I might try it now! Unfortunately I also don't own any minty eyeshadows, can you think of any dupes? Thank you! I really enjoy mint and purple together. The only mint I own is this one by wet n wild and it came in a palette that is discontinued...but I know Lancome has a minty green shadow (make it work) as does MAC (newly minted). Thanks! I just sit there and analyze, really lol. You're so insanely sweet, thank you SO much!! Of couuuuuurse we missed you! As usual, your inspiration, and your stunning application are beautiful.